ACI Land & Aquatic Management | Is That Leaning Tree Dangerous? Trees provide a multitude of benefits to a property. You may enjoy them for their functionality or aesthetics. You certainly enjoy that they bring up property values as much as 19 percent. In addition to the property values, they contribute in other financial ways. A tree built on the wayward side of a house provide as much as 12 percent reduction to energy bills. Trees provide activities for children, homes for birds, and clean the air. But a leaning tree puts all of that at risk. Not all tree damage or leaning is the same. Read this guide to learn everything you need to separate a safe tree from one that requires you to call a tree service. It is rare that one single indicator provides conclusive evidence of a problem. Systems tend to be complicated and take higher levels of knowledge to sort and categorize. The more complex the system, the more knowledge required. Living organisms, especially the large ones, bring in a further complication of self-regulation. In other words, you need to both be able to identify damage to a tree and to know the limits of the tree’s self-repair systems. To begin you need to identify a tree species if unknown using online guides. Not all tree species function the same. If you are in Englewood, FL coniferous pine trees native to Oregon won’t self-repair like a palm or citrus tree. This guide will start at the bottom and work upwards. We’ll indicate the bigger dangers from the slower growing concerns. Catching these warning signs early can mean the difference between saving or losing a tree or your house. The final item discusses the mechanism of the center of gravity and how it works to bring a tree crashing down. Roots provide a pair of useful functions to a tree. They both anchor the tree into the ground and provide essential nutrition. Since roots normally run underground, they can be difficult to physically check for damage and general health. to inspect root health without specialized tools and meters, you need to look for secondary characteristics. Tree roots which have become exposed from erosion or changes to a slope signal a problem. While uncovered, the roots can’t gather nutrients effectively. They also become exposed to physical damage from other animals. Roots need to be covered but not compacted. Properly aerated soil provides better water filtration and nutrient uptake than hard-packed soil. Roots don’t need to be completely exposed to indicate a problem. Cracking soil, sometimes called having soil, shows where roots are being forced upward. If a trunk is leaning opposite of a heaving soil, the tree is coming down. Structural roots that get cut stop anchoring the tree. These can be repaired with time, though damage on multiple sides of a tree will likely not have time to do so. Fungi growing on the trunk or in patches along the base of a tree indicate rot. When roots start to die and the rest of the tree follows it offers excellent breeding grounds for fungus. Finally, a weakness called SGR (stem girdling roots) can occur. When a sapling is planted too deep, the stem produces roots that wrap around the trunk. As the tree grows it becomes compressed by these initial roots. Trunks form the ‘torso’ of a tree and hold the other elements together. Damage to a trunk interrupts nutrient flow between the roots and branches. Damaging the trunk also compromises the structural support of a tree. Damage to a trunk can be overt or structural. Overt damage includes holes, missing bark, and burned areas. Holes get created by gouges or cuts into the bark that becomes diseased and opens up. These holes are not unlike an abscess in skin. Other holes get created when the tree loses a branch. The gap where the branch anchored to the tree can invite disease or foreign bodies. Generally, if the wood around a hole is healthy, the tree will recover. Structural damage comes from the makeup of the tree itself. A solid, solitary trunk offers excellent support, balancing the load above and anchored below. Some trees grow with multiple trunks or branch into separate sections early. These structures come in V or U shapes and split the load. When dealing with a tree that has grown V or U-shaped trunks it is crucial to keep the branch load even. Too much weight on either side splits the connective wood and forms cracks. Living in Englewood, FL you are likely to see more than a few trees with more than a few trunks. The only thing worse than a tree falling is a tree falling over in several directions at the same time. Cracks can occur from a variety of environmental pressures. Weight load is only one these. 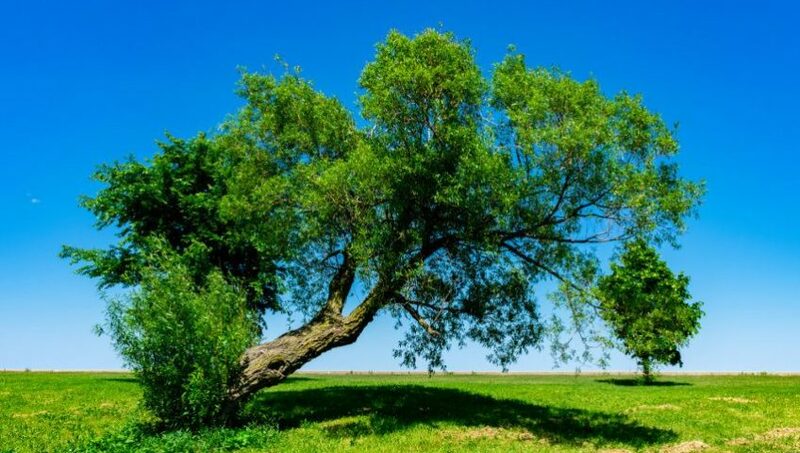 A tree that gets irregular amounts of sunlight and water, usually from a pool of water forming on one side or another, can form buckles. These structural abnormalities of healthy tissue surrounding a desiccated tissue create cracks. Lighting and fire damage can also crack a trunk or bark. If you’ve ever heard the pops and crackles from a wood burning fire, you know how that works out. Cracks can be surface or go deeper. Cracks on the outside of a trunk that prevent bark from growing together further weaken a tree. When bark doesn’t go all the way around a trunk, the flow of nutrients gets interrupted. Bark problems also include cankers. These spots of unshapely bark show where previous damage has occurred and the tree failed to recover. Bark works like the cardiovascular system in a human. Any time a line of bark is damaged, it limits the function above and below the break. Cankers are prone to failure from buckling effects. They may also die off altogether and start to rot. This invites fungus growth and spreads to connecting healthy wood. Branches provide a lot of functionality to a tree. Branches provide a necessary counterbalance to the wind. Branches also house leaves and fruiting bodies. Leaves do the majority of the chlorophyll work after sun absorption. Fruiting bodies carry or transport seeds, allowing the tree to propagate. Fruiting bodies also cause a problem when they grow unevenly as they weigh down branches and can cause damage. Fruit trees need to be picked multiple times in a growing season for this reason. Dead or brown leaves won’t collect sunlight and won’t produce energy for the tree. They also indicate that damage has occurred somewhere in the branch. A dead branch is literally dead weight. You should always consider getting dead branches and stumps removed to promote better growth. Removing dead tissue, in the form of branches, lets the tree dedicate resources to the living parts. This also prevents a catastrophic failure and a falling branch at a future point. Removing stumps frees up the underground real estate so other roots can fill the space. Trees that grow evenly and get pruned regularly are also more appealing. Much like exercise, that which makes the body healthy makes it more desirable. Rot occurs when the nutrient flow gets cut off from age, damage, or disease. More specifically, rot is the death of individual cells. In a human, this is called necrosis. Think of a finger turning black and falling off. For a tree, the damage can occur in many places that aren’t necessarily visible. Trees don’t have organs so they don’t have specific system failures. Signs of damage to systems such as the roots, trunk, and branches have already been covered. When rot occurs it can have specific signs that go along with. IN the case of roots, you look for mushrooms or sagging ground. In the branches, you look for browning leaves and peeling bark. In the trunk, you look for dead bark and dark discoloration. If you suspect rot, but can’t confirm it you will need outside help. We provide information on dying tree specifics here. When tree cells die they shrink, as they no longer hold water. This shrinking is what makes trees riddled with rot so infirm. It doesn’t take a high percentage of rot throughout a tree to compromise the structural integrity. Deadwood differs from rot in several ways. Rot causes drying of cells and interrupts nutrient delivery to healthy tissues. Deadwood, on the other hand, is material that has been cut off altogether. Deadwood happens when a branch or root is killed by a form of shock. The wood then ‘cure’s or becomes harder instead of degrading. Interestingly, in some cases, trees with deadwood are sturdier and more wind resistant. Deadwood will still have signs of an issue. Leaves will be dead and not regrow and bark will slough off. Not all harm that happens to a tree is natural or hard to spot. Direct harm to a tree can obviously kill it or damage it significantly. Hopefully, you don’t have any random Englewood, FL youths pledging their love to each other in your trees. If you see letters, shapes, and patterns cut into bark this can cause long-term damage. Shallow cuts in bark can regrow or heal. Deep cuts which pass through the bark into the trunk or branch will start decay processes. If you have construction around your home, be careful to place barricades and warning near trees. These need to be wide enough to protect roots. Remember that compacting the ground around a tree can cause root damage as much as a cut or break. The rule is to count for 1 foot of root for every 1 inch of trunk diameter. After a heavy storm, you should check for cracks and splinters. Any damage to the branches should be noted. Check that your soil is not eroding off of the roots. If your suffer heavy rainfall and don’t have proper drainage, your tree could be floating over a future sinkhole. Check trees for signs of direct damage whenever you have a lot of activity around a tree. What ultimately causes a tree to fall is a shift in the center of gravity that can’t be recovered from. An object will fall over when the bulk of its mass goes beyond its line of symmetry. If you want to get into the heavy math and engineering in a 3D space, check out this informative guide. Of course, living things tend to move and can right themselves as long as the shift in mass doesn’t happen too quickly. A person that gets pushed can apply force along pivots points (joints) and recover equilibrium. Trees complicate the matter by having multiple pivot points and an anchoring system. The anchor allows a much larger amount of force to be applied and still keep the center of gravity from shifting as the whole body doesn’t shift. Branches can sway a long way and still remain viable because their internal tensile strength gives them flexibility. The more irregular the shape of a tree, the more likely it will have problems. The weight at the top of the tree pulling in multiple directions creates balance. This balance gets disrupted by wind but spread out across the whole body. If you stand in a strong wind, you can maintain balance more easily by standing with your limbs in. If you put both arms out, you feel more force. If you put only one arm out, you quickly get pulled to one side. Trees operate much the same way. The general rule of thumb (that doesn’t require heavy math) is 20 degrees. If your tree doesn’t have the bulk of its branches and trunk out of line by 20 degrees off the center it’s considered stable. Now you have a thorough list of information to check for in regards to your trees. Most of these checks will only take a few minutes of your time and can be done while admiring the beauty of your landscape. If you have a leaning tree beyond a 20-degree angle, make certain you have the roots checked. If you have more tree questions or feel like a removal is necessary, contact us. We’ll be happy to check out your situation in the Englewood, FL area.